Wafer thin, lightweight, and can mould to a curved surface. These Semi-Flexible Solar Panels are made of the high efficiency mono-crystalline solar cells and strong enough to be walked on. Semi-flexible panels are weather, water and corrosion resistant making them a perfect option for marine applications, RVs, camping and emergency back-up These panels can continuously recharge your 12-Volt batteries with the power of the sun. Light enough to mount on a window with suction cups, and durable enough to mount permanently outdoors on a range of vehicles. The Coleman 18 Watt Solar Battery Charger Kit comes with a 7 amp charge controller that works with cars, RVs, boats, tractors, ATVs, electric fences, deer feeders and more! The kits amorphous solar panel works in all daylight conditions, even on cloudy days. Made with high efficiency crystalline solar cells, the Coleman 85 Watt Crystalline Solar Panel is the ideal solution for RVs, homes, boats, back-up and remote power use, 12 Volt battery charging, solar power stations and pumps. Easy to install and completely maintenance free, this solar panel includes an aluminum frame for extended outdoor use and a bypass diode that minimizes the power drop caused by shade. The panel is also weatherproof for superior durability. With a maximum power output of 85 W and 4.9 Amps, multiple panels can be connected to gain more power. The complete unit includes an 85 Watt crystalline solar panel, wiring, brackets, screws, and a voltage tester. The Nature Power 1000-Watt modified Sine Wave Inverter is perfect for recharging devices on the go and for people with mobile lifestyles. This offers 1000-Watt continuous power and 2000-Watt peak surge power. Compact, portable and great for running laptop, small televisions, lights, fans, radios and more. The Nature Power 1,000-Watt Pure Sine Wave Inverters convert 12V DC power into 120V AC power and provides power similar to the power supplied from your home electrical outlets. The Pure Sine Wave inverter, as opposed to the Modified Sine wave inverter, is great for running high sensitive equipment that need clean power like computers, monitors, TVs. It will also support high starting power appliances like microwaves, and power tools. The electronic appliances are able to run cleaner, cooler, and quieter on pure sine wave power. So in return pure sine inverters can save energy costs and extend the life of appliances. 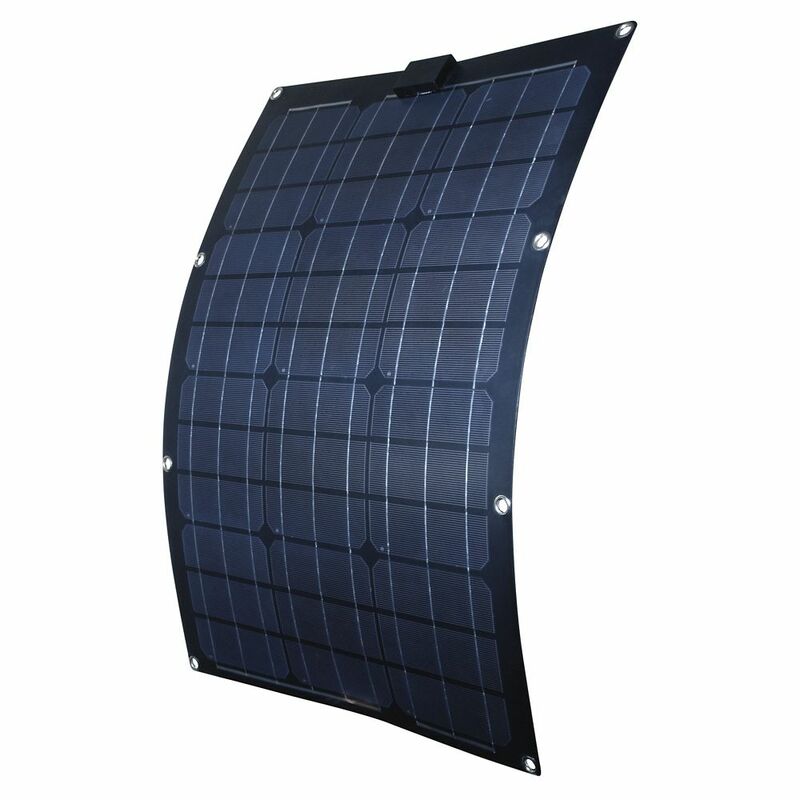 50-Watt Semi-Flex Monocrystalline Solar Panel for 12-Volt Charging Wafer thin, lightweight, and can mould to a curved surface. These Semi-Flexible Solar Panels are made of the high efficiency mono-crystalline solar cells and strong enough to be walked on. Semi-flexible panels are weather, water and corrosion resistant making them a perfect option for marine applications, RVs, camping and emergency back-up These panels can continuously recharge your 12-Volt batteries with the power of the sun. Light enough to mount on a window with suction cups, and durable enough to mount permanently outdoors on a range of vehicles.